Cowboy Party Rentals is the number one place for Midlothian Event Rentals! We are proudly located in Midlothian, Texas and we are ready to help you with you with all your event and party rentals! Do you have an event or party to plan for? Cowboy Party Rentals is your one stop shop to get all your event and party needs. We offer a variety of inflatable entertainment as well as the basics for any party or event. Bounce houses are always a hit at any party or event! Kids will absolutely go nuts when they see these colorful inflatables set up in any lawn or gymnasium. You can choose from our standard bounce house or really amp up the party and try out our Dry Castle Bounce Combo that has a slide and a bounce house all in one unit! The fun just won't stop with a combo bouncer! Our interactives, like the 60' Mega Obstacle Course, are great for school fundraisers and company team building events or picnics. 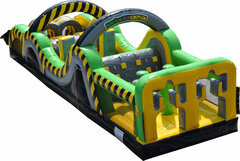 Your guests will have hours of entertainment bouncing around obstacles, climbing and racing to the end! Cowboy Party Rentals offers a wide variety of rentals for any event. We have everything you need to set up virtually anywhere. If you don't have a power source for your inflatables we rent Generators for your convenience. Contact us today to reserve all your party and event rentals today! If you have any questions our friendly staff are always willing to help or feel free to reference our FAQ. Learn more about our Margarita Machine Rentals in our last blog. We love setting up our party rentals ar parks, Click here to see local parks!